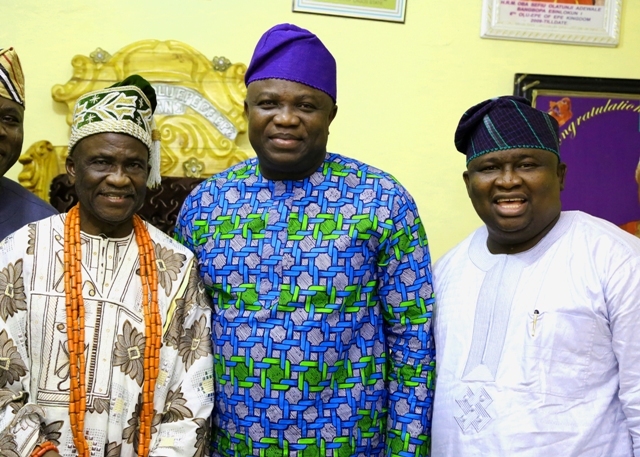 Lagos State Governor, Mr. Akinwunmi Ambode on Thursday eulogized the life and times of the late activist and foremost lawyer, Dr. Tunji Braithwaite, saying he had always been fascinated about his disposition towards the masses and the people of Nigeria. 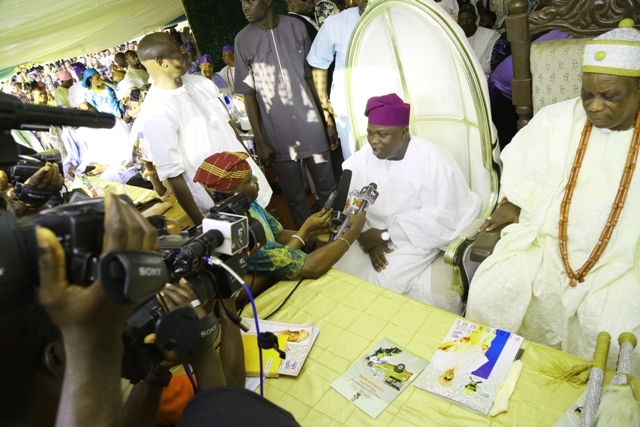 Governor Ambode, who spoke at the burial service, held in honour of late Braithwaite at Reverend Braithwaite Memorial Anglican Church, Epe, said he was a beneficiary of the kindness of the Braithwaite family, saying the late nationalist fought for good causes and for Nigerians throughout his lifetime. Lagos State Governor, Mr. Akinwunmi Ambode (left), with wife of the deceased, Dr. (Mrs.) Grace Braithwaite (2nd right); Son, Dr. Olumide Braithwaite (right) and Daughter, Mrs. Ebunolu Adeosun (3rd right) during the Funeral Service for Dr. Tunji Braithwaite, at the Reverend Braithwaite Memorial Church, Papa Epe, Lagos, on Thursday, April 28, 2016. The Governor said apart from the fact that Braithwaite was consistent and persistent in the fight to enthrone better society for all Nigerians, he was also a deeply religious man who contributed positively and immensely to the body of Christ. He also recalled how the late activist started the campaign for positive change and egalitarian society long before the advent of the current administration which is known for its change mantra. 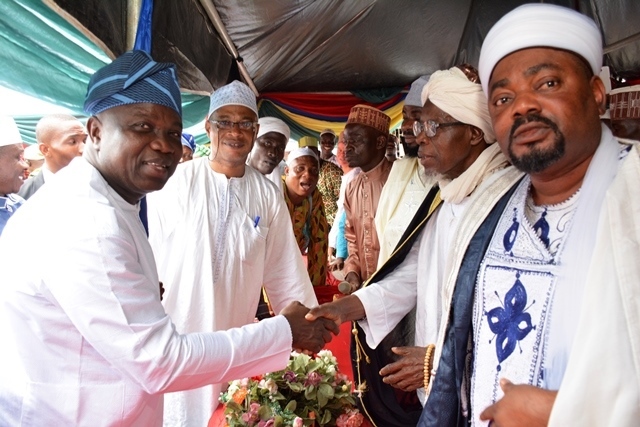 R-L: Lagos State Governor, Mr. Akinwunmi Ambode, with former Deputy Governor of Lagos State, Otunba Femi Pedro and Deputy Governor of Ogun State, Mrs. Yetunde Onanuga during the Funeral Service for Dr. Tunji Braithwaite, at the Reverend Braithwaite Memorial Church, Papa Epe, Lagos, on Thursday, April 28, 2016. “I just want to encourage the family because we are celebrating and we know that those yet unborn will read about what Dr. Braithwaite actually stood for. He was a foremost lawyer, statesman and an activist. He spent all his life fighting good causes especially for the common man. He fought for what he believed in and he had strong conviction to be the voice of the voiceless and whatever it is that we are advocating as change today has actually been manifested from all the things he had preached about. “He was consistent and persistent in the fight to enthrone better society for all Nigerians. He was deeply religious and this church is one of his contributions. He has left good footprints on the sand of time for us, including myself to follow and his efforts will never be in vain,” the Governor said. In his sermon, Bishop of Lagos Anglican Diocese, Most Revd. Dr Adebola Ademowo said from the testimonies of people about the late Braithwaite, he sure led an impactful life and queried the congregation about what people would say as well concerning them. Drawing his lessons from the book of Matthew 25: 14-21, Romans 12: 6 and 1Peter 4:10, Ademowo said Braithwaite never buried his talent but used it to fight against corruption, injustice and a system promoting mediocrity and criminal wealth. The clergyman said Nigeria is a complex country with myriads of bad users of talents, and advocated that the national rebirth of the country must start with everyone, through inculcation of virtues of selflessness, honesty, integrity, among others. 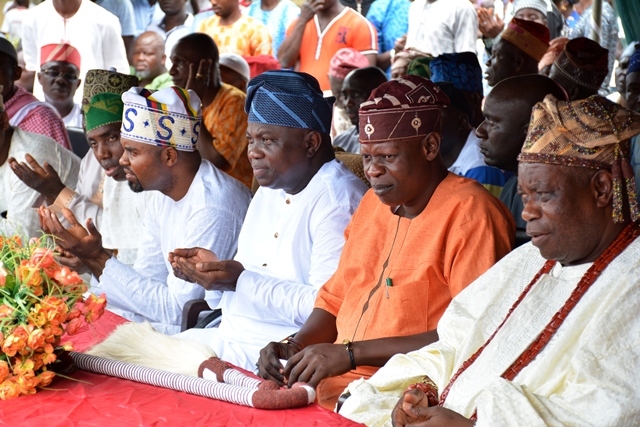 Lagos State Governor, Mr. Akinwunmi Ambode at the weekend assured Lagosians that he would fulfill the electoral promises he made to the people, especially in the areas of infrastructural renewal. 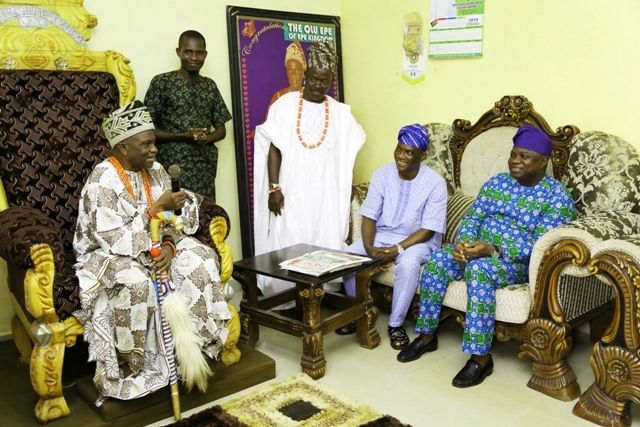 The Governor, who spoke at the 2015 Ojude Oba Epe Festival held at the Epe Recreation Ground, Epe, said the infrastructural renewal drive of the previous administration in the state will receive adequate attention in the course of his administration. 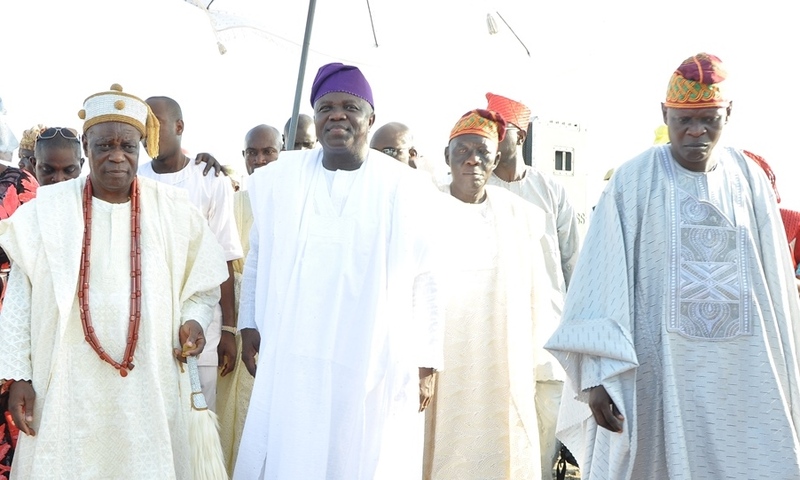 L-R: Lagos State Governor, Mr. Akinwunmi Ambode, the Oba of Epe Land, Arolugbade Elepe II, Oba Kamorudeen Ishola Animashaun and Chairman of the Occasion, Mr. Olalekan Adebiyi during the Ojude Oba Epe 2015 Celebration, at the Epe Recreation Ground, Epe, on Saturday, September 26, 2015. “One of the things that we did promise during the campaign is that we would continue with the infrastructural development of my predecessor and at the same time improve on it and that’s what we’ve started with areas where we feel that there are immediate palliatives that we can give, we have done that but more importantly, is for us to improve on the network in which Mr. Babatunde Fashola had actually laid down”, he said. 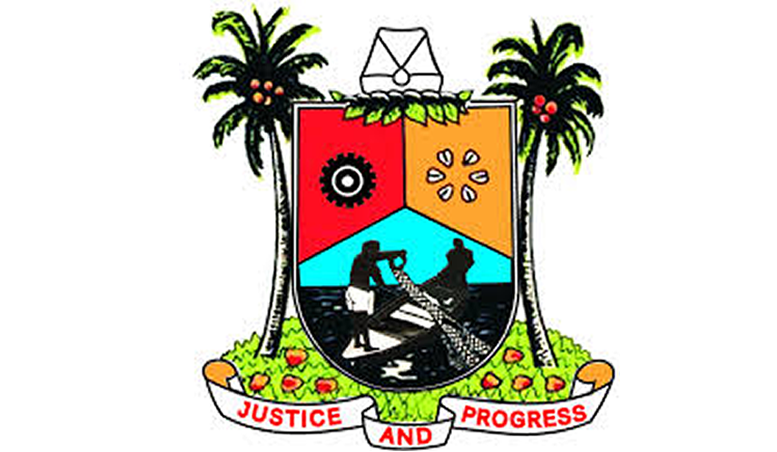 Governor Ambode said the used the first three months of his administration to set up an institutional framework, assuring that going forward, Lagosians will begin to witness development across the state. 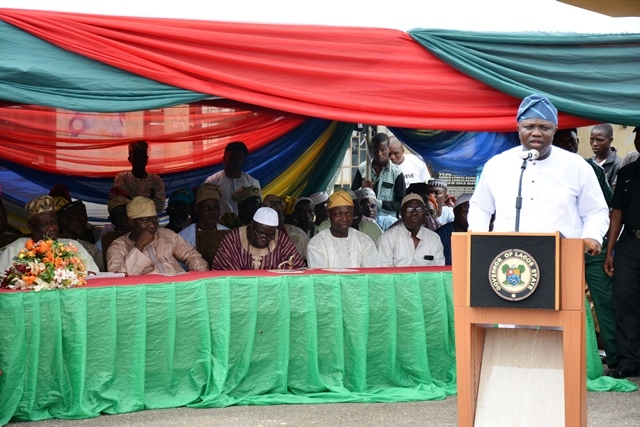 Lagos State Governor, Mr. Akinwunmi Ambode, acknowledging cheers during the Ojude Oba Epe 2015 Celebration, at the Epe Recreation Ground, Epe, on Saturday, September 26, 2015. With him is the Oba of Epe Land, Arolugbade Elepe II, Oba Kamorudeen Ishola Animashaun. “I have no choice, I have to do it for all Lagosians, that’s what I am committed to do, I have said I am going to be selfless about service and that’s what I am going to do and you will see it. What I have done in the last three months is to set up the institutional framework and If you want to build a house, you have to lay the foundation, you will now see what I’ll be doing in the next three and half years, just watch and you would see it”, he said. 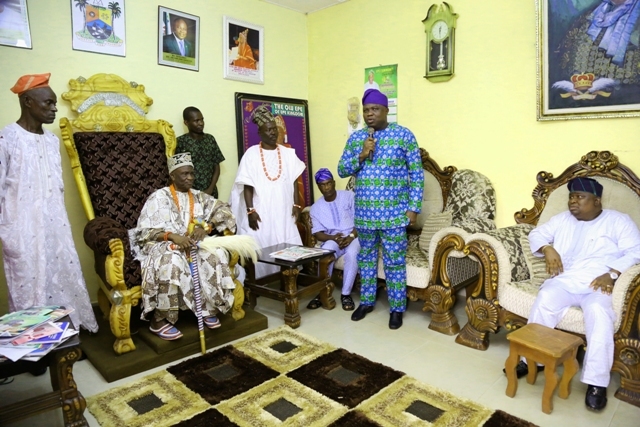 He also assured the people of Epe that development will also get to the area, saying aside being a native of Epe, the town has witnessed less development in recent times. 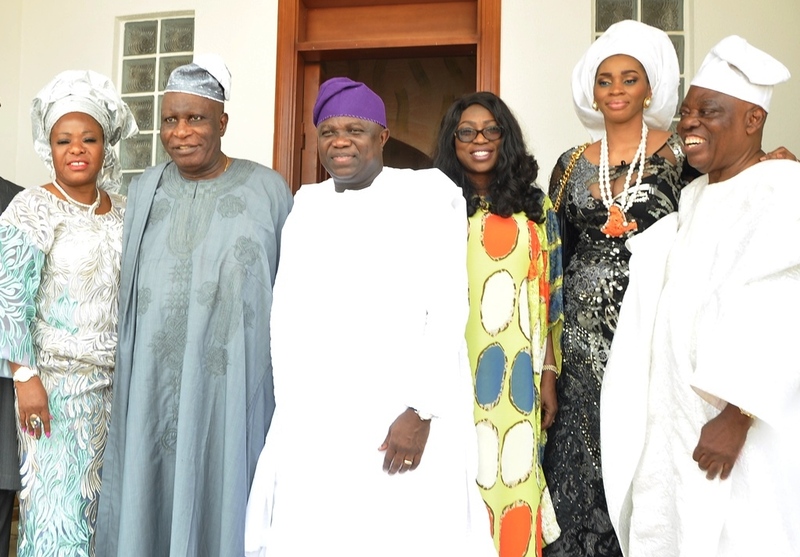 R-L: Lagos State Governor, Mr. Akinwunmi Ambode (3rd left), Chairman, Eleganza Groups, Chief Razak Akanni Okoya, his wife, Folashade, First Lady of Lagos State, Mrs. Bolanle Ambode, Asiwaju of Epe Land, Justice Adesola Oguntade (rtd.) 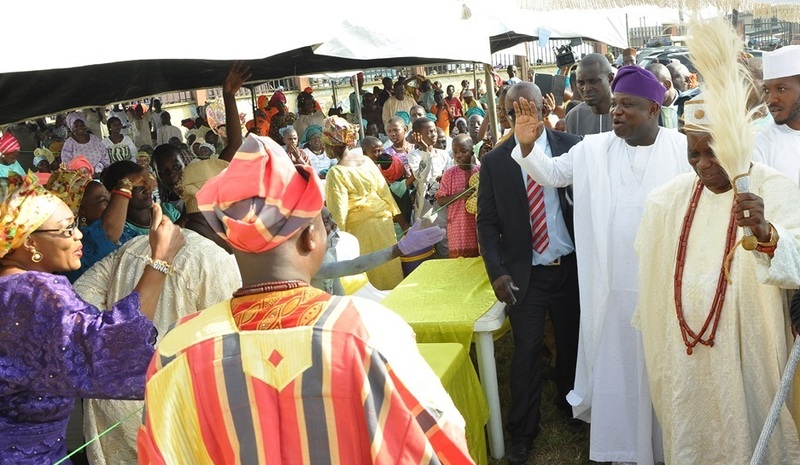 and his wife during the Ojude Oba Epe 2015 Celebration, at the Epe Recreation Ground, Epe, on Saturday, September 26, 2015. For Epe, you can see, in terms of the rural local governments, Epe is the most rural and in terms of the divisions, Epe is the least of all the five divisions. So for them, the best thing we can do is to increase the infrastructural development here in Epe and also help them to develop in other areas”, the Governor said. 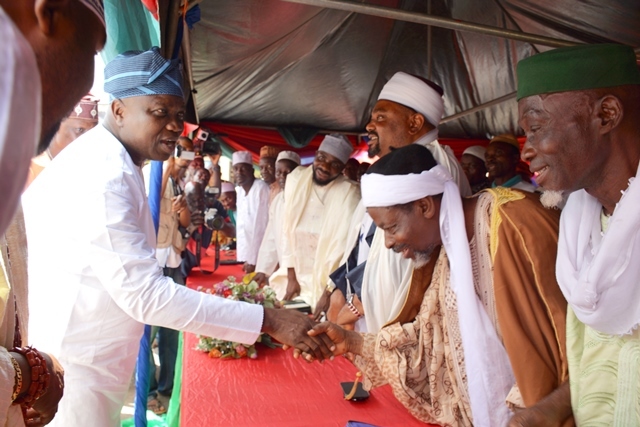 Dignitaries at the festival include the Oba of Epe Land, His Royal Majesty, Oba Kamorudeen Ishola Animashaun, Asiwaju of Epeland, Justice Adesola Oguntade Rtd., Chairman Eleganza Group, Chief Rasak Okoya, Senator representing Lagos West Senatorial District, Adeola Olamilekan Solomon, Chief of Staff to Lagos State Governor, Mr. Olukunle Ojo, among others. 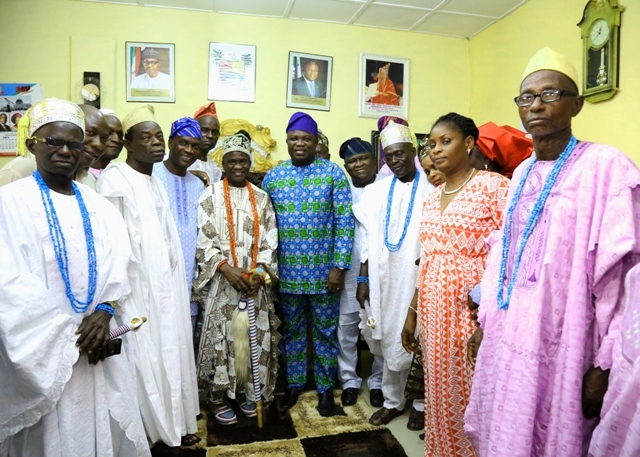 L-R: Lagos State Governor, Mr. Akinwunmi Ambode (middle) with the Oba of Epe Land, Arolugbade Elepe II, Oba Kamorudeen Ishola Animashaun, Apase of Epe Land & Patron, Ojude Oba 2015 Planning Committee, Alhaji Akanni Seriki Bamu and the Executive Secretary, Epe Local Government, Hon. 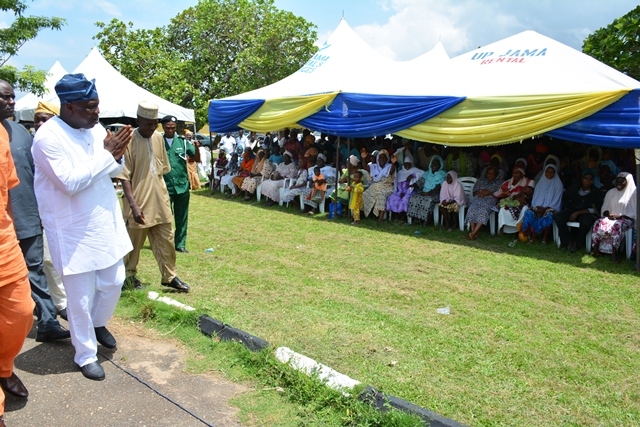 Hammed Seriki, during the Ojude Oba Epe 2015 Celebration, at the Epe Recreation Ground, Epe, on Saturday, September 26, 2015. The All Progressives Congress (APC) governorship candidate in Lagos state, Akinwupnmi Ambode has expressed his devastation at the death of Olu of Epe’s son, Kunle Adewale, and five others in a boat mishap today while returning from their polling unit in a riverine area of Epe. Until his death, Kunle was a Director in the Lagos State Ministry of Local Government and Chieftaincy Affairs. 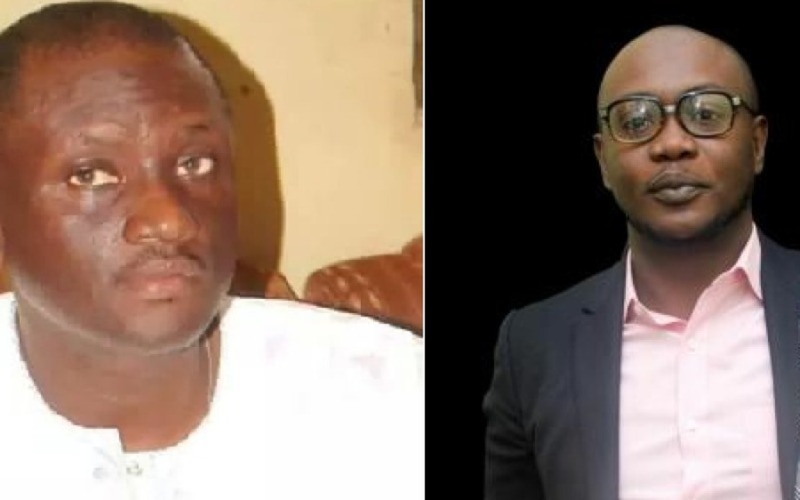 The monarch’s son, a local government chairmanship aspirant, Mr. Muiz Bello and four others had gone to cast their votes for the All Progressives Congress when their boat capsized on their way back. “It is a really sad day for the entire Epe town. I am devastated by this loss of Kunle. I saw Kunle this morning, so this is a real shock to me. 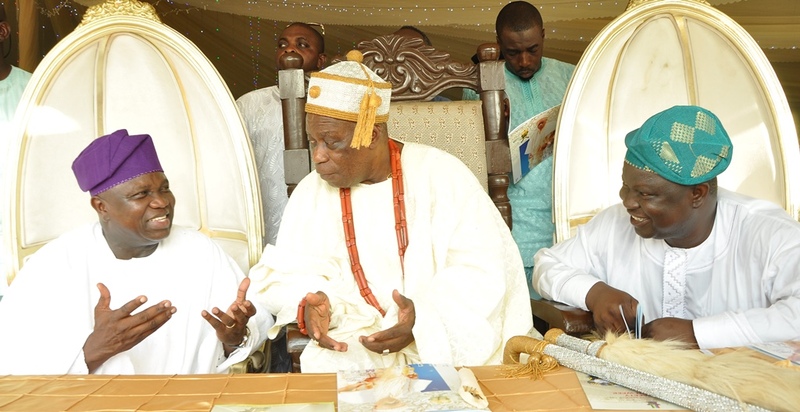 On behalf of my family, my campaign team and myself, I commiserate with His Royal Majesty, Olu of Epe, Oba Shefiu Adewale, the family of Muiz Bello, the Mogaji family and the other families who have lost loved ones in this unfortunate occurrence. I pray God grants them the strength to bear this loss and that souls of our loved to rest in peace. Ambode also expressed utter dissatisfaction at the news of electoral violence that has led to deaths across the country. There have been reports of two INEC officials and some voters killed in Gombe; scores of APC members and a Soldier shot and killed in Rivers state as well as incidents of violence in Borno and Yobe states. “These reports of killings are really disturbing and completely unacceptable”. 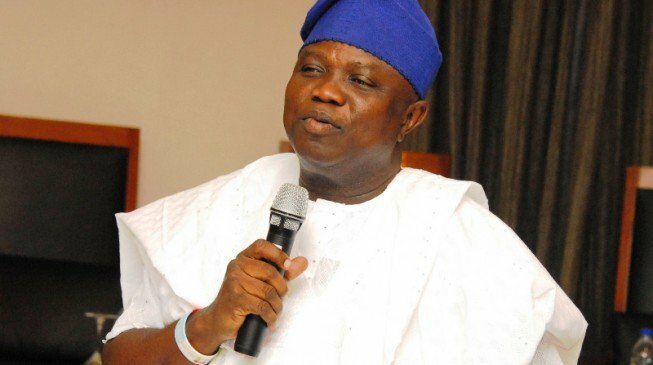 Ambode extended his condolences to the families stating that they are “heroes who died for the cause of rescuing the Nation”.